Eat This Much has moved some of its best premium features to free accounts, so now you can track and plan your meals in addition to getting ideas for what to eat next. A calendar, so you can plan what you will eat and track what you have eaten. 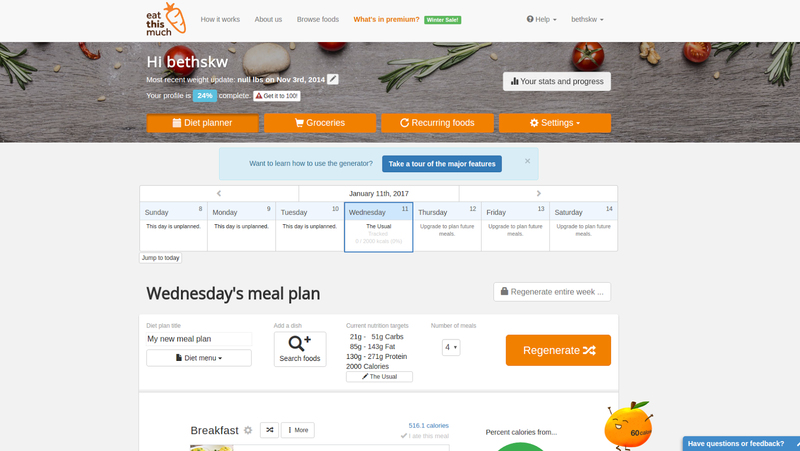 An "I ate this" button, to add meals that you've already eaten to the calendar. If you already ate (and logged) breakfast but want new ideas for dinner, Eat This Much will keep that in mind rather than regenerating the entire day's menu. Statistics on your past meals, so you can tell if, for example, you're truly eating low carb like you promised yourself you would. A restaurant meal search, to find foods that fit your diet. Alternative meals, so you don't have to keep hitting the "regenerate" button when Eat This Much gives you a dud. Just click on the offending meal and pick an alternative. Premium accounts still have a major thing the free ones don't: They can plan two weeks' worth of meals and give you a shopping list. Read more at the link below.